G’day guys, Sean Dove here, back with another Cinema 4D quick tip! Today I wanted to take a look at how we can create this fun text inflate animation using the pose morph tag to drive it. To initially set this up we are going to be using a technique that EJ from Eye Design recent showed us. In his amazing tutorial he shows us how to create these cloth inflation simulations and gets absolutely incredible results! So using his technique we are going to art direct an inflated and deflated state of our text then take advantage of the pose morph tag and the new falloff system to have full control animating between the two different states. With that said, lets jump in and have a play! Made famous by movies like vertigo and jaws however it's not uncommon for animations to also take advantage of this effect to help asset with the story. With that in mind, let's jump into Cinema 4D and have a look at setting up a dolly zoom and see the results we can get. Thanks for watching guys, really appreciate it! Hey guys, Sean Dove here back with another Cinema 4D quick tip. Today I wanted to look at how we can create this fun, cartoony, icing effect using some of the new tools in R20. We’ll see how quickly it is to set up and be able to get it to sit nicely on our object we are icing. Of course we’ll then animate it on using the new fields system. Alright get your chef hats ready and let’s jump in! Hey guys Sean Dove here. A little while ago I got sent the opening title sequence for a kids show called Figure It Out and I was asked how could we go about recreate their effect. This creative piece was made by the team over at BUCK and as someone who loves playing with perspective I was really excited to try this technique. In the clip we see this skewed text projected onto this underground, carpark style, scene - and with a nice camera swing we start to see the text begin to line up before reaching that final sweet spot where it reads seamlessly. So I thought we'd have a quick look at putting together a scene using simple shapes and then have a play with some camera projections and perspective and see how it turns out! Special thanks to Oliver Santiago for allowing me to use his artwork to demonstrate this technique - make sure you check out his full series, the whole thing is insane. Hey guys Sean Dove here and today Ive got a quick tip I want to share that I think you’ll like! Working with splines is one of my favourite things to do inside cinema 4D. I grew up playing with photoshop using the pen tool to create paths so splines just made sense to me - they’re great for typography or to create a path for an object to follow. However a detailed spline can be time consuming to set up. What I mean when I say this is when you import a spline to Cinema, lets say a text path you’ve set up in photoshop or illustrator, it comes in flat - but what I want to create is this nice interweaving within the spine and ultimately a heap of depth. I say this can be a time consuming because if you have a path with 50 or even 100 points, manually placing them can be extremely tedious- Ive done my fair share of manual spline point placement so I though I had to find a way to speed up the process. Im going to share a quick tip for how to create this nice interweaving and depth within your spline, without needing to move even one point - to demonstrate this technique Im going to use a spline inspired by a single line art piece from french creative duo DFT. The work these guys are doing is stunning, ill pop a link down below to their work go check them out, seriously impressive! Also shoutout to Vincent Montel and the Spewmen for sharing their bands music video with me where they used one of my tutorials to create these great clips - they really pushed it further and the end result looks great! Thanks guys! Hey guys! Not long ago I posted a video showing you how to morph objects within a lathe nurb and what many of you wanted to know was is it possible to then morph into a third object? Or even a 4th?? If you haven't seen the original video I've popped a link down below and I encourage you to check that out first if you want to see this set up from scratch! Hey guys - today we are going to have a play using the melt deformer and some basic sculpting techniques, to pull off this melting cheese type effect. I recently had to find a way to make melting cheesy text so I thought I would share the simple tricks I used to start building up this look! Hey guys, today we are going to look at how we can make some epic rock type in 3 simple steps. Cinema 4D R19 arrived at my door the other day and to say I was excited is an understatement. I was stuck between a rock and a hard place trying to come up with a way to create text that looked like it was made up of boulders but still have full control to swap out the text at any point. With R19 the answer is just a stone's throw away. In this tutorial we are going to take a look at the new detailing and glue options in the update Voronoi fracture, light and texture our scene then we will finish off in Adobe Lightroom for some final adjustments. The very nature of how people interact and consume media is constantly evolving. Social media platforms have securely positioned themselves as a top choice for not only artists and entertainers to find an audience but advertisers too. In such a crowded space, clever thinking is paramount to building up a following - one way to do that is to see the platform as more than a house for your content but an interface to interact with. In this tutorial, we will use some simple camera and modeling techniques to create videos that appear to interact with the interface of popular social media platforms. Hey, we are going to look at 3 ways we can use splines to make neon type and signs inside Cinema 4D. Who doesn't love a bit of neon action? I feel like one of the biggest requests I get is to create neon typography, and I love it! On top of that though if you're working on a branding project it's always nice to show the mark beyond its vector form, give it a bit of real world context - and a nice shiny neon sign of your new logo can be a great way to do that. let's jump straight in and I'll show you the 3 ways I found to make these neon signs really quick! Hey, I wanted to start this one on a bit of a personal note. There are officially over 1000 of you guys subscribed to my channel since I started posting tutorials a couple of months ago and I have to say the support has been insane and a great motivator to keep doing what I'm doing - so thank you. 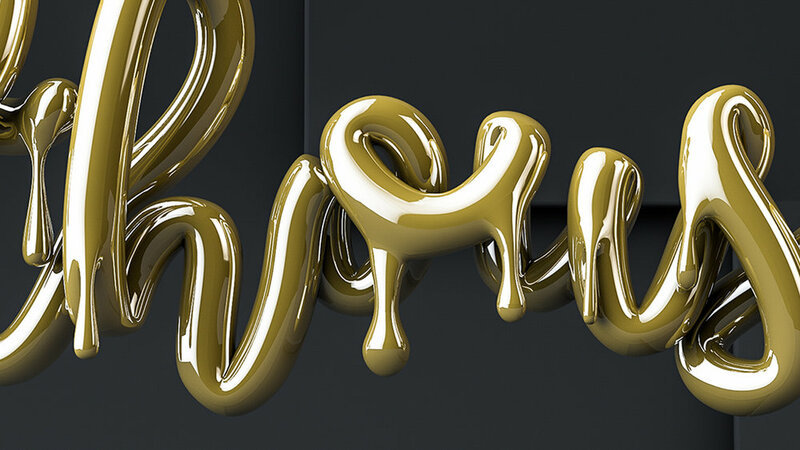 On that note, I thought it would be fun to create some dripping gold text to celebrate this milestone. We are going to play around with the spine wrap, the pose morph, sculpt tools, some modelling - let's get straight to it!